The coalition’s landmark submission to CEDAW — the first to focus exclusively on the role of a tax haven in undermining human rights outside its borders — is the beginning of a pioneering collaboration between the Center for Economic and Social Rights (CESR), the Global Justice Clinic at New York University School of Law, the Tax Justice Network (TJN) and Berne Declaration. The submission was prepared in advance of CEDAW’s Pre-Sessional Working Group Meeting, to be held March 7 – 11 in Geneva, which will identify the list of issues on which Switzerland’s review before the treaty body will focus later this year. The submission argues that — despite some laudable reform efforts — Switzerland’s notoriously opaque and lax policies in the areas of finance and taxation may well contravene its obligations under Article 2 of the Convention on the Elimination of All Forms of Discrimination Against Women, which it ratified in 1997, and the International Covenant on Economic, Social and Cultural Rights (ICESCR), which it ratified in 1992. As a State Party to both treaties, Switzerland has committed to refrain from adopting or implementing laws and policies which directly or indirectly result in the denial of women’s equal enjoyment of their rights, whether within its jurisdiction or in other countries. It is also obliged to protect against private sector conduct that undermines rights, including through regulation of the banking sector and other corporate actors, and to cooperate internationally to mobilize the maximum available resources for the fulfillment of women’s economic, social, and cultural rights. The submission outlines Switzerland’s role in facilitating cross-border tax abuse and the impact this has on women’s rights in countries such as Zambia, which loses billions each year in potential revenue due to tax abuse facilitated in part by Switzerland’s lax tax and financial rules. It also highlights critical policy safeguards — such as impact assessments, exchange of taxpayer information, country-by-country corporate tax reporting and whistleblower protections — which Switzerland should put in place to prevent such abuse and to mitigate its harmful human rights impacts. This initiative is part of a broader movement to bring human rights to bear in tax policy debates. Pressure has been building for some time, among both civil society organizations and the international community, to confront the ever-increasing levels of domestic and international tax abuse that are fuelling inequality and starving government coffers around the world. Indeed, this pioneering effort to account for the gendered impacts of financial secrecy was borne of discussions at an international strategy meeting, Advancing Tax Justice through Human Rights, convened in Lima, Peru last April by CESR, Tax Justice Network and other tax justice and development allies from around the globe. In this context, Switzerland’s appearance before CEDAW presents an opportunity not just to address the deleterious impacts of one country’s financial secrecy, but also to deepen the international human rights system’s engagement with cross-border tax abuse as a structural impediment to the full realization of human rights, particularly in low- and middle-income countries. It could also help advance normative standards and substantive understanding of the role that human rights law can and must play in taxation and financial policy. The submitting organizations have requested that CEDAW probe Switzerland on the steps it is taking to ensure that its financial secrecy policies and rules on corporate reporting and taxation are consistent with its extraterritorial obligations under the Convention. If the request is heeded, CEDAW’s forthcoming review of Switzerland could prove an important milestone in the international human rights movement’s efforts to tackle the injustice of tax abuse. 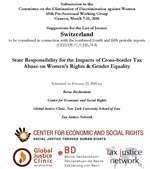 The joint submission to CEDAW – "State Responsibility for the Impacts of Cross-border Tax Abuse on Women’s Rights & Gender Equality" – can be downloaded here.